INTRODUCING…Cop On Her Doorstep Hero, JAKE STEFANI. Before we start your interview, how about telling us a little about yourself, where you’re from, what you do for a living, what hobbies you have, etc. Whatever you’d like to share to introduce yourself. 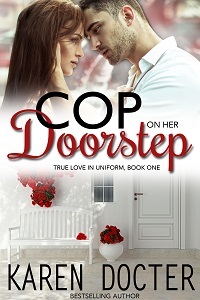 I’m the hero from Karen Docter’s novel, COP ON HER DOORSTEP, True Love In Uniform Series, Book One. I’m a Riverton (yeah, she made up the town, too), Colorado police officer. I’m also a member of the S.WA.T. team comprised of officers from several surrounding communities on the northern edge of Denver. I’m Italian, speak both my mother’s language and Spanish, and have a German Shepherd named Riker. I was kind of floundering in the back of Karen’s head for a while but now she’s letting me tell my story. My full name is Giacobbe Marcos Stefani, but only my traditional Italian mother insists on using it, usually when I’m doing something that provokes her. Giacobbe is Italian for Jacob. My friends all call me Jake. My best friend is my partner, Ramón. We both joined S.W.A.T. about a year ago and ride together when we’re on regular shift. When we’re not at work…well, I’m always at the precinct or training in some way. I don’t have much to go home to, but Ramón is married to the love of his life and they have four children. They’re always great about inviting Uncle Jake to do family things with them. I try not to intrude too often. I recently bunked on their basement couch for four months after my ex-girlfriend kicked me to the curb. I only hang with Ramón at work now that I’m moving into my new house. I’m too busy unpacking, remodeling my house, and getting to know my luscious new neighbor, Carrie, and her eight-year-old son, Eric. Despite the fact I’m Italian, I don’t have a huge family in the States. My dad died shortly after I followed in his footsteps and graduated from the academy. I’m Mama’s only child and sometimes that can be a pain, especially since she’s made it her life’s mission to marry me off so I can start making all the bambinos she wants. She’s only lived in the States the last 35 years and has definite ideas about her duties…and mine…to the family name. But, I love her. She lives about an hour and a half away since I moved to Riverton seven years ago to work in the same precinct as my Uncle Jules. It’s just enough distance to keep her from showing up all the time with potential wife material. Not that she doesn’t succeed in sideswiping me occasionally. Mama’s set her heart set on my ex-girlfriend. I’ve yet to convince her that it’s over, that I’m pursuing my own woman who, luckily enough, lives two doors down and across the street. When I joined the force in Riverton, my uncle wasn’t my superior. Now, he’s my captain. We have a good relationship but work at keeping our personal and professional lives separated. My uncle isn’t Italian. He met Mama’s sister when she came to the States for my parents’ wedding. Uncle Julian was my dad’s Best Man as well as his partner. I have two cousins, Gino and Lorenzo, who are my age. We spent a lot of time together growing up, camping and fishing. The rest of the Mazzotti-Stefani family lives in Italy. I met a bunch of them several years ago when I took Mama there for my great-grandfather’s funeral. Just thinking of going back makes me shake in my boots. If I thought Mama was bad with her incessant matchmaking, she is a neophyte compared to the rest of them. There were more single women at my great-grandfather’s funeral than lived in the nearest four villages. I’m not going back there again until I’m safely married with half a dozen kids in tow! 4. Do you have a secret? If so, who do you need to keep the secret from and why? I don’t normally keep secrets. However, I do have one I’m keeping from Carrie until she gets to know me better. She knows I’m a police officer. After all, I did bring her son home after I caught him in my backyard about to make mischief. But she’s got a bad history with cops, especially S.W.A.T. cops. I need to work on her perception of my uniform before I spring on her that I’m also S.W.A.T. like the officer who killed her husband. Once she accepts my uniform, I’m confident she’ll get past the rest. 5. Look down. Describe what you’re wearing. Is this the way you’re normally dressed? If not, what do you normally wear? I’m on vacation at the moment, so I’ve hung my police uniform in the closet for the duration. It’s what I wear when I’m on shift. I’m afraid you caught me in the middle of my house renovation. I’ve been stripping wallpaper off the walls in one of the spare bedrooms. Why anyone would hang wallpaper on Spanish stucco is beyond me! Anyway, I’m wearing my favorite jeans, a faded black t-shirt with chunks of wallpaper paste and dust, and tennis shoes. Hmm, one is loosely tied. I’d better tighten it up before I climb back up that ladder. I’ll wear black jeans, a blue cotton shirt, and my black leather moto jacket tonight when I take Carrie out to dinner. I’ve been living in Ramón’s basement for months and taking on quite a few double shifts, so I’ve been eating out a lot. I’ve only been in my new house three weeks, and my kitchen is sort of bare. I make a mean ravioli when I have the time to stock up my freezer, so you’ll have to come back in a few weeks. You know, we could drive down to Colorado Springs to one of Mama’s bi-monthly dinner parties. It will take us an hour and a half, but it will be worth the drive. She always makes plenty of her famous spaghetti and meatballs and she loves to feed friends and family. I’m afraid of losing another kid to gang violence. Ever since a ten-year-old kid from my old neighborhood died in my arms, I’ve been doing everything I can to get rid of the SKL gang that has taken hold on Riverton’s west side. They killed Mateo Reyes, his older brother Julio has gone missing, and I’ll be damned if I’ll let them destroy any more lives. I’m afraid I’ll never find Julio and bring him back to his grieving mother. I’m afraid I will find him and have to give him back to her in a box to lay alongside his brother. I’m holding tight to my mission…maybe too tight, if my superiors were right to force me to take a vacation. But I won’t rest until I find Julio. 8. You’re doing intense spring cleaning. What is easy for you to throw out? What is difficult to part with, and why? I’d have a hard time getting rid of anything at the moment. My girlfriend kicked me to the curb four months ago, remember? She took damned near everything with her, including my self-respect and my dog, Riker, and I ended up living on my partner’s couch. I guess it was easier to walk away from everything than to fight for it at the time. The only thing that mattered back then when our relationship imploded was that I’d lost Mateo and Julio. The few basic things I kept were stored in Ramón’s garage until I closed on my new house. Now, I’m unpacking it and rebuilding my life one piece at a time. If I had one regret, it was losing Riker. Me and him were buddies, and I miss training him. But what the hell was I supposed to do with a dog? I didn’t have a home. I was working all the time. If I had to do it all over again, I’d have kept him. I didn’t want to impose on Ramón and Maria any more than I had to, but we could have worked something out somehow. After hearing me go on and on about my ex-girlfriend, you’d expect me to say she broke my heart. But the truth is we were in trouble even before I moved in with her. When she traded me in for a better cop model, a friend and one of my co-workers, I was more pissed than anything. Removed from the situation, I quickly came to realize I was too damned stubborn to accept that I’d made a mistake, that I was letting Mama’s matchmaking and my need to have a family of my own get in the way of my good sense. I think Carrie could break my heart…if she doesn’t accept my uniform. 10. What makes you laugh out loud? Carrie’s boy, Eric, makes me laugh out loud. He’s a great kid who has definite opinions and isn’t afraid to tell you. For instance, when I asked Carrie to help me organize a barbecue so I could meet the neighbors, he didn’t want her to invite the Lawrences. When I asked him why, he told me I’d know who Mrs. Lawrence was right away because I’d be throwing up all over the place. After meeting Kitty and experiencing one of her creative dishes first hand, I knew exactly what he meant. The kid might only be eight-years-old but he’s fun to be around. Speaking of Eric and Carrie, I need to clean up the debris in the spare bedroom before I can change for my date with Carrie. It’s been great talking to you. I hope your readers stop by and pick up my story. Wait! I was supposed to tell you that the reason you’ve been talking to me all this time, and not Karen, is because she’s already busy digging into Rick Davis’s story. He’s one of my fellow officers at the precinct and needs Karen’s help getting his woman back. Watch for COP CRASHES THE WEDDING in the fall! BE SURE TO COME BACK to read more about Karen, her release, and an excerpt from COP ON HER DOORSTEP on Wednesday’s Karen’s Killer Book Bench. Happy Reading! Thanks for stopping by to check out Jake, Glenda. I love the man. He IS pretty great. Still waiting for Amazon to get the book up on their site but it will be there today…I hope! Please be sure to check! Feel like I know Jake a little better. And I loved this,the interview with a character from the book, it was way cool. I can’t wait to hear how you like the book. Good luck in the giveaway! Thanks for sharing, Jake! I loved your story, and I can’t wait for Rick’s! I’m glad you enjoyed visiting with Jake, bn100.